Red Bull Racing duo Daniel Ricciardo and Daniil Kvyat made a solid start to the Chinese Grand Prix as Mercedes reasserted their dominance. Having struggled with brakes in Malaysia, the Tilbrook team reverted to their 2014 specification pads in a bit to alleviate their problems. But with Mercedes on top form once again, both Red Bull drivers trailed Lewis Hamilton’s fastest time by two seconds. However, Hamilton’s time of 1:39.003 was 1.124 seconds faster than third placed driver, and Malaysian GP winner Sebastian Vettel, and 1.628 seconds faster than Kimi Raikkonen in fourth. 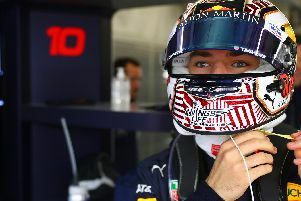 Ricciardo finished the opening free practise session with the sixth fastest time of 1:41.029, 1.996 seconds slower than Hamilton, while Kvyat was just behind him in seventh with 1:41.097, 2.064 seconds adrift of the fastest time.